In Worthington Smith’s Man, the Primeval Savage there is a very vividly written description of early Paleolithic life, from which much of the following account is borrowed. In the original, Mr. Worthington Smith assumes a more extensive social life, a larger community, and a more definite division of labour among its members than is altogether justifiable in the face of such subsequent writings as J. J. Atkinson’s memorable essay on Primal Law. For the little tribe Mr. Worthington Smith described, there has been substituted, therefore, a family group under the leadership of one Old Man, and the suggestions of Mr. Atkinson as to the behaviour of the Old Man have been worked into the sketch. Mr. Worthington Smith describes a squatting-place near a stream, because primitive man, having no pots or other vessels, must needs have kept close to a water supply, and with some chalk cliffs adjacent from which flints could be got to work. The air was bleak, and the fire was of great importance, because fires once out were not easily relit in those days. When not required to blaze it was probably banked down with ashes. The most probable way in which fires were started was by backing a bit of iron pyrites with a flint amidst dry dead leaves; concretions of iron pyrites and flints are found together in England where the gault and chalk approach each other. The little group of people would be squatting about amidst a litter of fern, moss, and such like dry material. Some of the women and children would need to be continually gathering fuel to keep up the fires. It would be a tradition that had grown up. The Mousterian Age implements, and all above it, are those of Neanderthal men or, possibly in the case of the rostro-carinates, of sub-men. The lower row (Reindeer Age) are the work of true men. 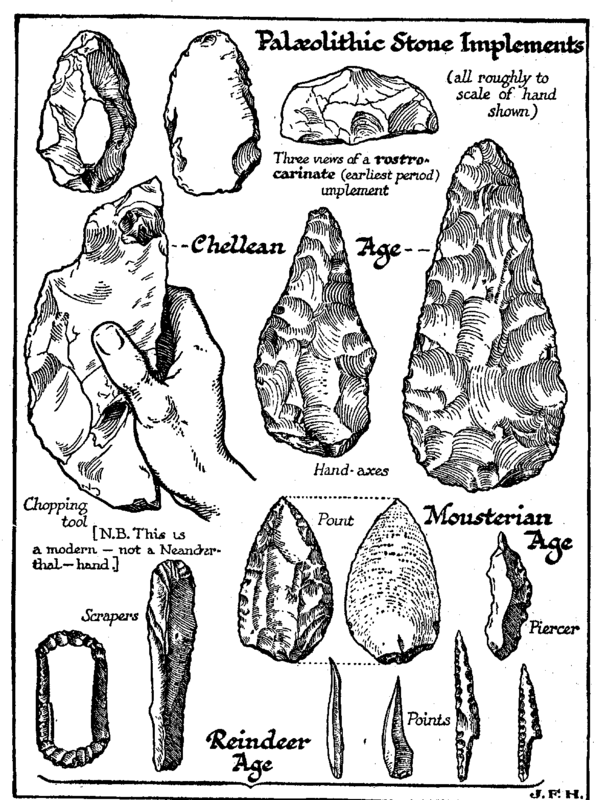 The student should compare this diagram with Figure 47: Time Diagram Of The Glacial Ages, and he should note the relatively large size of pre-human implements. The young would imitate their elders in this task. Perhaps there would be rude wind shelters of boughs on one side of the encampment. The Old Man, the father and master of the group, would perhaps be engaged in hammering flints beside the fire. The children would imitate him and learn to use the sharpened fragments. Probably some of the women would hunt good flints; they would fish them out of the chalk with sticks and bring them to the squatting- place. There would be skins about. It seems probable that at a very early time primitive men took to using skins. Probably they were wrapped about the children, and used to lie upon when the ground was damp and cold. A woman would perhaps be preparing a skin. The inside of the skin would be well scraped free of superfluous flesh with trimmed flints, and then strained and pulled and pegged out flat on the grass, and dried in the rays of the sun. Away from the fire other members of the family group prowl in search of food, but at night they all gather closely round the fire and build it up, for it is their protection against the wandering bear and such-like beasts of prey. The Old Man is the only fully adult male in the little group. There are women, boys and girls, but so soon as the boys are big enough to rouse the Old Man’s jealousy, he will fall foul of them and either drive them off or kill them. Some girls may perhaps go off with these exiles, or two or three of these youths may keep together for a time, wandering until they come upon some other group, from which they may try to steal a mate. Then they would probably fall out among themselves. Some day, when he is forty years old perhaps or even older, and his teeth are worn down and his energy abating, some younger male will stand up to the Old Man and kill him and reign in his stead. There is probably short shrift for the old at the squatting place. So soon as they grow weak and bad-tempered, trouble and death come upon them. What did they eat at the squatting-place? Primeval man is commonly described as a hunter of the great hairy mammoth, of the bear, and the lion, but it is in the highest degree improbable that the human savage ever hunted animals much larger than the hare, the rabbit, and the rat. Man was probably the hunted rather than the hunter. The primeval savage was both herbivorous and carnivorous. He had for food hazel-nuts, beech-nuts, sweet chestnuts, earthnuts, and acorns. He had crab- apples, wild pears, wild cherries, wild gooseberries, bullaces, sorbs, sloes, blackberries, yewberries, hips and haws, watercress, fungi, the larger and softer leafbuds, Nostoc (the vegetable substance called ‘fallen stars’ by country folk), the fleshy, juicy, asparagus-like rhizomes or subterranean sterns of the Labiatoe and like plants, as well as other delicacies of the vegetable kingdom. He had birds eggs, young birds, and the honey and honeycomb of wild bees. He had newts, snails, and frogs — the two latter delicacies are still highly esteemed in Normandy and Brittany. He had fish, dead and alive, and fresh-water mussels; he could easily catch fish with his hands and paddle and dive for and trap them. By the seaside he would have fish, molluscs, and seaweed. He would have many of the larger birds and smaller mammals, which he could easily secure by throwing stones and sticks, or by setting simple snares. He would have the snake, the slow worm, and the crayfish. He would have various grubs and insects, the large larvae of beetles and various caterpillars. The taste for caterpillars still survives in China, where they are sold in dried bundles in the markets. A chief and highly nourishing object of food would doubtlessly be bones smashed up into a stiff and gritty paste. A fact of great importance is this – primeval man would not be particular about having his flesh food over-fresh. He would constantly find it in a dead state, and, if semi-putrid, he would relish it none the less — the taste for high or half-putrid game still survives. If driven by hunger and hard pressed, he would perhaps sometimes eat his weaker companions or unhealthy children who happened to be feeble or unsightly or burdensome. The larger animals in a weak and dying state would no doubt be much sought for; when these were not forthcoming, dead and half-rotten examples would be made to suffice. An unpleasant odour would not be objected to, it is not objected to now in many continental hotels. The savages sat huddled close together round their fire, with fruits, bones, and half-putrid flesh. We can imagine the old man and his women twitching the skin of their shoulders, brows, and muzzles as they were annoyed or bitten by flies or other insects. We can imagine the large human nostrils, indicative of keen scent, giving rapidly repeated sniffs at the foul meat before it was consumed; the bad odour of the meat, and the various other disgusting odours belonging to a haunt of savages, being not in the least disapproved. Man at that time was not a degraded animal, for he had never been higher; he was therefore an exalted animal, and, low as we esteem him now, he yet represented the highest stage of development of the animal kingdom of his time. 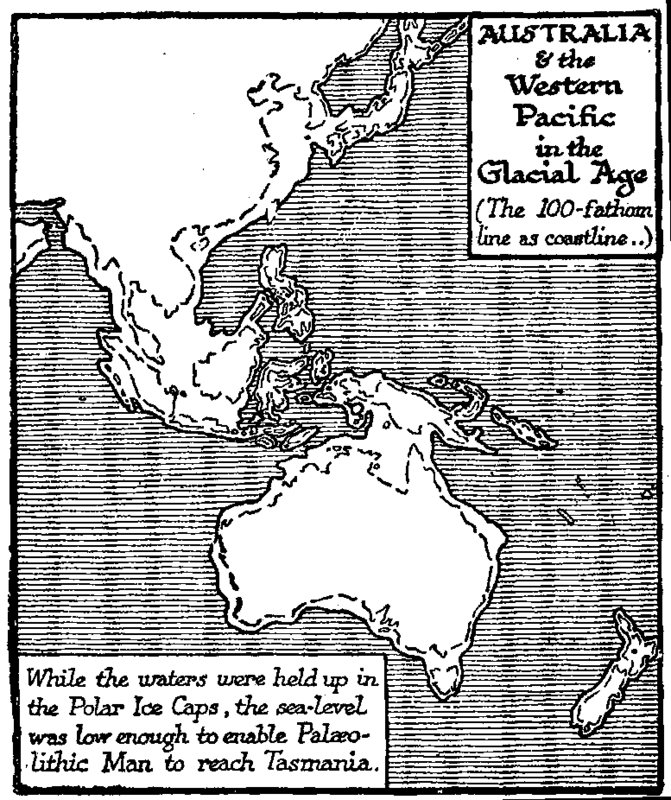 While the waters were held up in the Polar Ice Caps, the sea-level was low enough to enable Paleolithic Man to reach Tasmania. That is at least an acceptable sketch of a Neanderthal squatting-place. But before extinction overtook them, even the Neanderthalers learnt much and went far. Whatever the older Paleolithic men did with their dead, there is reason to suppose that the later Homo Neanderthalensis buried some individuals at least with respect and ceremony. One of the best-known Neanderthal skeletons is that of a youth who apparently had been deliberately interred. He had been placed in a sleeping posture, bead on the right fore-arm. The head lay on a number of flint fragments, carefully piled together “pillow fashion”. A big hand-axe lay near his head, and around him were numerous charred and split ox bones, as though there had been a feast or an offering. To this appearance of burial during the later Neanderthal age we shall return when we are considering the ideas that were inside the heads of primitive men. This sort of men may have wandered, squatted about their fires, and died in Europe for a period extending over 100,000 years, if we assume, that is, that the Heidelberg jaw-bone belongs to a member of the species, a period so vast that all the subsequent history of our race becomes a thing of yesterday. Along its own line this species of men was accumulating a dim tradition, and working out its limited possibilities. Its thick skull imprisoned its brain, and to the end it was low-browed and brutish.